Expect the unexpected in a hospital! In-patients have cardiac arrests or need immediate assistance to prevent falls, the ambulance arrives at the ER with a dying patient, an outsider tries to breach security, and floods and earthquakes threaten the hospital infrastructure. These are just some of the unplanned emergencies which occur 24/7 and need immediate staff attention. To signal these events, jarring alarms are sounded to get the attention of busy staff members. Noise levels in hospitals have increased ten-fold in the last five years, and are continuing to escalate. The resulting cacophony of chirping cardiac monitor alarms, voice and beeper paging systems, and flashing lights and sirens assaults the senses of hospital workers and patients, causing sensory overload. Paradoxically, as this background noise increases, auditory alarm signals have to get louder. Hospital noise interferes with patients’ sleep and healing resulting in the need for more pain and sleep medications and longer length of stay in the hospital. Meanwhile, the same noise can distract clinical staff and cause them to make mistakes. Eventually clinical staff can become overloaded from this noise, a state known as “alarm fatigue.” Studies have shown that some nurses are exposed to as many as 350 alarms per patient per day! Over time patient care-givers can become so desensitized to the din of excessive alarm noise that a life-threatening event can be overlooked from delayed or missed alarm responses. With constant and intense stimulus, how DO you get someone’s attention? Should alarms keep getting louder? Should flashing bright lights be added? How can we better understand this problem, and where can we gain inspiration for a better, less disruptive system? The human information processing system (what we call “attention span”) has the ability to select and organize sensory stimuli so we can focus on relevant thoughts or actions while ignoring irrelevant distractions. Our attention can only handle so much. Similar to information processing by computers, attention is a limited resource with a finite capacity. The pressure for a hospital worker to multi-task is tremendous, yet focusing on more than one task at a time is very difficult. Add in alarm fatigue, and hospital staff are bound to lose their attention and eventually make a mistake because of it. Are the multitude of hospital alarms designed to help keep patients safe having the opposite effect and causing danger to patients through staff alarm fatigue? What can we learn from peacocks and salamanders? How do animals avoid “alarm fatigue” in the natural environment? The sounds, visuals, colors, and smells used in animal signaling have been successful at attracting or detracting other animals for hundreds of thousands of years. When a male peacock spreads his splendid tail into a beautiful fan, dancing so the feathers rattle while vivid and abundant eye markings are displayed in shimmering colors to attract females for mating, do the salamanders watch as well? 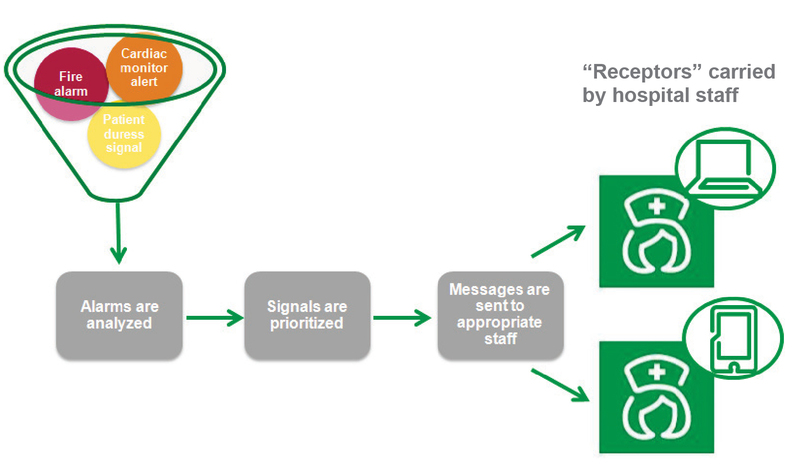 Or, more likely, do these signals only reach the intended recipient, thus avoiding unintended sensory overload. Q: What can we learn from the animal world around us? A: The reception of a signal is as critical as the emission! When specialized receptors are used, a signal can alert the appropriate recipient to take the necessary action without sending a generalized alarm. In a hospital, where critical events occur anytime and anyplace, an “intelligent” hub could make decisions about who to notify, what action should be taken and how urgent the response should be. Alarms signaling emergency situations could be translated into a sequence of instructions sent to the right people at the right time, avoiding non-specific alarms that everyone within earshot could hear. With an intelligent hospital communications system in place, nurses and physicians can focus their attention on patient care, and patients can focus their attention on healing. It’s a win/win situation. In what ways is your hospital trying to reduce alarm fatigue? Please comment below. Don’t forget to follow Schneider Electric Healthcare Solutions on Twitter @SE_Healthcare. Great article. Hospital noise is a significant problem reported on patient satisfaction surveys. Thank you Tim! It’s a hot topic for many reasons. The benefits of reducing noise can be significant for patients, staff, and the hospital as an organization. Schneider Electric is looking into the challenges and potential solutions in great detail – expect more to come!